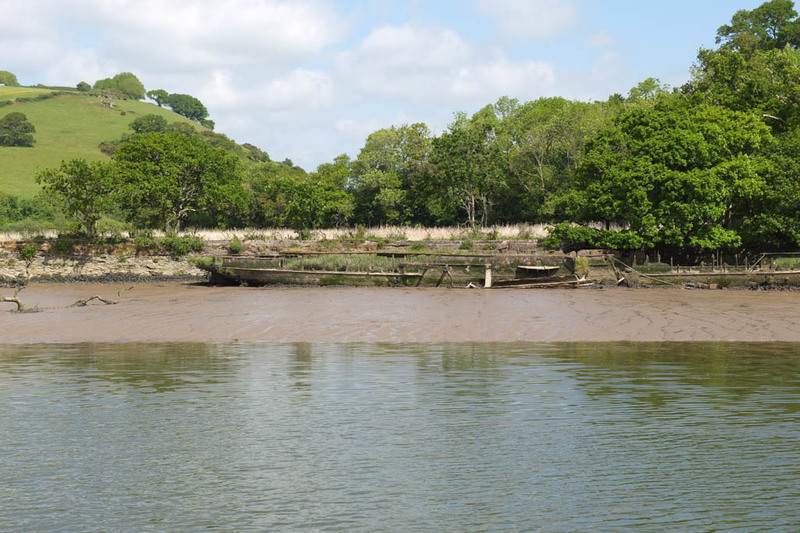 The River Dart runs through 18.5 miles of Devon countryside and is navigable from Dartmouth to Totnes. Dartmouth is best known for its Regatta and the Naval College, but is also a deepwater harbour, although it sees little commercial shipping these days (aside from an occasional cruise ship visit). However, given the county’s popularity as a holiday destination, the river is home to hundreds of leisure craft as well as car and passenger ferries and tourist boats. 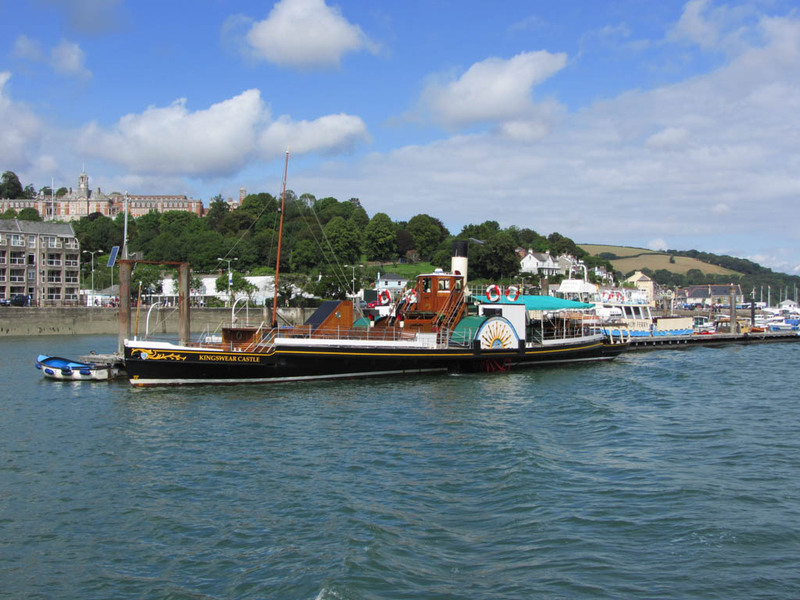 The most significant of the latter is the Kingswear Castle, once one of several paddle steamers that were built on the river, for service on the river with the River Dart Steamboat Company. The Kingswear Castle is the only survivor and while it isn’t the only paddle steamer in the country, it is the last coal fired one. The current Kingswear Castle was built to replace an earlier ship that carried the same name, as well as the same engines. Built in 1904, she was withdrawn from service in 1924, her engines were donated to her successor and her hull left to rot at the side of the river where the last remains can still be seen today (just). The current Kingswear Castle was built in Dartmouth in 1924 for service on the Dart between Dartmouth and Totnes, a job it did until 1965. By then, it was more economic to use diesel powered / screw driven boats, so the steamers were withdrawn. Kingswear Castle is the only survivor. It ended up being bought by the Paddle Steamer Preservation Society, who also own PS Waverley, who took her to the Medway and over many years restored her to working condition. She re-entered service on the Medway in 1985 and returned to the Dart in 2013. It was interesting to see how small she was compared to the steamers I’ve seen and blogged about on Lake Lucerne. Kingswear Castle is just shy of 35m in length, whereas the Swiss ones are around 62m. Interestingly Waverley is 73m long, but was designed as a sea-going ship rather than a lake / river steamer. Also on the river is Philip and Sons shipyard where the Kingswear Castle was built. In its 141 year history, the yard built hundreds of vessels including the lightship Edmund Gardner that can be seen in the Albert Dock in Liverpool). This was the last industrial shipyard on the Dart and closed in 1999 but is still in use as a marina. Finally, any visit to the area would be incomplete without a visit to the Dartmouth Steam Railway. This is a bit of a misnomer as the railway actually runs into Kingswear, which is on the opposite bank of the river to Dartmouth. Confused? You will be – there was actually a Dartmouth Railway Station on the quay in Dartmouth – passengers had to buy tickets there and cross the river by ferry to catch the train from Kingswear Station. Dartmouth station still exists but is now a cafe and I forgot to take a picture of it. The railway itself was of course once part of the Great Western Railway network and was part of the Beeching cuts. The railway, while a ‘heritage’ line in the sense that it runs steam trains along a former GWR branch, runs 7 days a week and is employs by full time staff rather than volunteers. It has also provoked anger amongst some of the railway enthusiast community by naming all of its locomotives (not all of the engines would originally have been named when in GWR / BR service). None of this particularly bothers me – it is a well run line with good facilities that is hugely popular with the many tourists to the area.